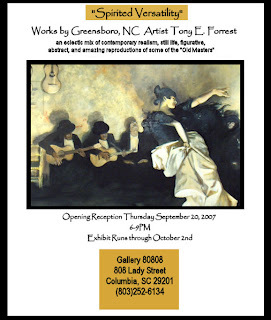 Above is the invitation to the art event opening this week at Gallery 80808, 808 Lady Street featuring work by North Carolina artist Tony E. Forrest. Free parking for this exhibition is available after 6 PM in the parking lot diagonally across Lady Street from the Gallery…although entrance to this park is off Washington Street across from the police station. Additional information about Vista Studios and Gallery 80808 is available at the website: www.gallery80808vistastudios.com.